After 10 years of farming and gardening, Harvest Moon still revolves around many of the same core tasks found in almost every single game in the series. Growing crops, raising animals, making friends and building a bustling homestead are all essential to the franchise - fans have come to expect these elements in each new installment. Past additions and minor changes to the formula have mostly been welcome improvements. 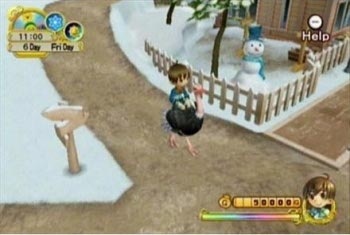 However, with Harvest Moon: Tree of Tranquility for the Wii, the series shows signs of slowing down. Your arrival on the economically faltering Waffle Island is good news for the local citizenry. Since the Mother Tree's health failed long ago, the island's residents have fallen on hard times. They've been unable to turn their luck around - presumably due to their general cluelessness and ho-hum attitude - and consequently put a lot of faith in your abilities to bail them out. After an eager welcome from the mayor and his posse, you'll pick a piece of land to settle and get straight to work on the twofold task of building your plot into a prosperous farm and bringing about the return of the Mother Tree and Harvest Goddess. It's a minor variation on the same recycled tale anyone who's played a Harvest Moon game should already know well. Tree of Tranquility sports a new visual style that alternates between moments of beauty and instances of pure dullness. Certain areas of the island are particularly pleasing to look at, but so many other areas come off as bland by comparison. The game looks quite different, but it's not a huge graphical improvement. Frustrating camera angles never let you get a good look at the land in which you're running around. It's also a pain that most of the peripheral scenery in the game, such as bushes and tree outcroppings, are completely impassable. There's another aspect of Waffle Island that stands out immediately: its size. There's far more ground to explore here than in past games. This would be a blessing if it weren't for the introduction of load time transitions between every area on the map. It takes long enough to walk from one area of the island to another, and many of the different shops and locations you'll frequent are spread far and wide; having to wait another five or more seconds when moving to a new district feels agonizingly slow. Adding insult to injury, an immense amount of time will pass before you can unlock the option to buy a horse, and it takes even longer before you're able to ride it.